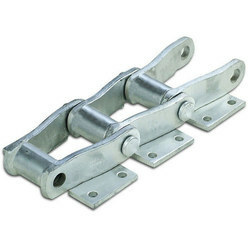 Supplier & Exporter of Elevator Chains. Our product range also comprises of Industrial Couplings, Link Belt Bearing and Elevator Belts. Backed with well qualified and experienced team members we are engaged in offering an exclusive range of Elevator Chains. These products are used to lift the dam gates that supply the hydropower. These products are designed especially for Asphalt Batch Plants, Paving and Road Construction, Mining, Construction, Pulp and Paper and Energy industries. Looking for Elevator Chains ?